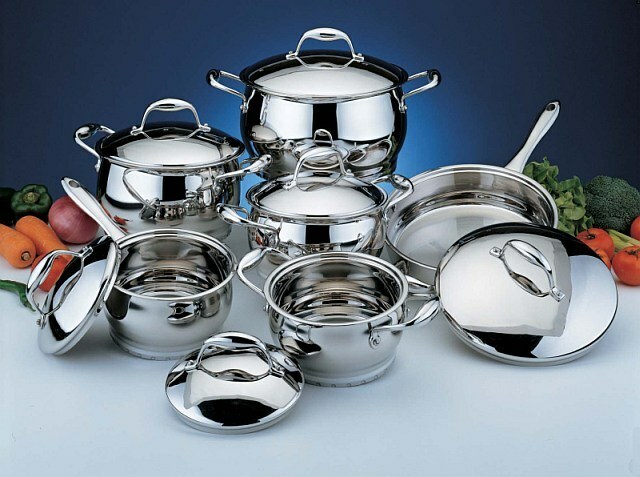 Stainless steel cookware over the last few years has gained the greatest popularity among buyers. It keeps the food warm for a long time. It is therefore particularly important in the care of her not to damage the shiny coating. So how to clean stainless steel cookware? Stainless steel cookware should be washed in warm water with a liquid detergent (liquid dishwashing detergent or liquid soap). In any case, do not use abrasive powders, as the surface will appear scratches and the coating will lose its functionality and former glory. If you accidentally burned food in a pot made of stainless steel, just fill it with warm water, add a little baking soda and leave for a couple of hours in this condition. Then left to rinse well and dry with kitchen utensils. This is necessary in order to avoid white spots from dried water. Often can be seen on the bottom of the dish white precipitate that is formed due to the impact of hard water. In order to eliminate it, you just boil a pot of clear liquid at the bottom of a little vinegar. If you wish to prevent the build up of limescale in the stainless steel pan, immediately after boiling, add salt to your food. If the bottom of the dish burnt part of food, it can be easily removed without the use of hard brushes and graters. Fill pot or pan with hot soapy water and put on fire. Boil for ten minutes. Now burnt places easily cleaned even with a soft sponge. Probably, every housewife ever in your life ran the milk. Then there are burnt places on the bucket or the pan. To clean these stains, you need to take a few tablets of activated charcoal and grind into powder. Sprinkle it on the burned place and pour water. Leave in this state for 10-15 minutes. Then place dirt easily cleaned. Rinse the dishes and wipe dry with a soft and clean cloth. Before first use stainless steel cookware you need to thoroughly wash it with hot soapy water, rinse and thoroughly dry. Do not use a dishwasher for washing dishes of this alloy.